WBA super-middleweight champion Andre Ward is "open" to a rematch with Carl Froch, but does not believe the Briton wants to fight him again. The 29-year-old American beat Froch, who holds the IBF belt, on points in Atlantic City in 2011. 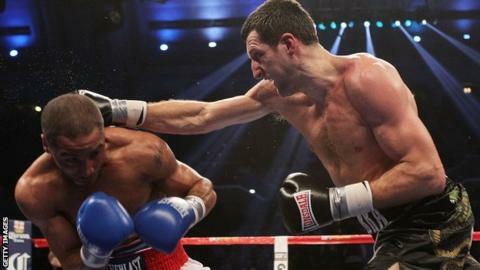 In his latest fight Froch, 36, secured a controversial ninth-round stoppage of George Groves on Saturday. "From a legacy standpoint, Froch needs me more than I need him," Ward told BBC Radio 5 Live. "I can go off and fight other guys and never mention Carl Froch's name again." Ward, who has won all 27 of his professional fights, fears he could be the victim of a poor decision if the bout took place in Britain. Froch's defeat of Groves in Manchester, the 32nd victory in his 34 fights, came when his opponent was leading on all three judges' cards. Groves believes his countryman will lose his "credibility" if he does not agree to a rematch with him after the "unjust" stoppage. Ward said: "I'm not concerned about fighting in front of his fans, but it is about not getting a fair shake. I've realistic concerns. "Like I said, it's my legacy at stake if he didn't beat me, but if something happens like in the Groves fight then that is tough to live down. It's a lot of moving pieces." Ward admitted there has been exploratory discussions over a rematch with Froch since he beat Edwin Rodriguez on points in a non-title super-middleweight fight earlier this month. "I know that my promoter [Dan Goossen] has contacted his promoter to see what interest there is," added Ward. "The initial conversation took place after Froch's rematch with Mikkel Kessler [in May], but I was still injured and we couldn't move forward then the way we wanted to. "I don't know all the detail, but I've been in the game long enough to know if both sides want a fight to be made, the fight will be made."